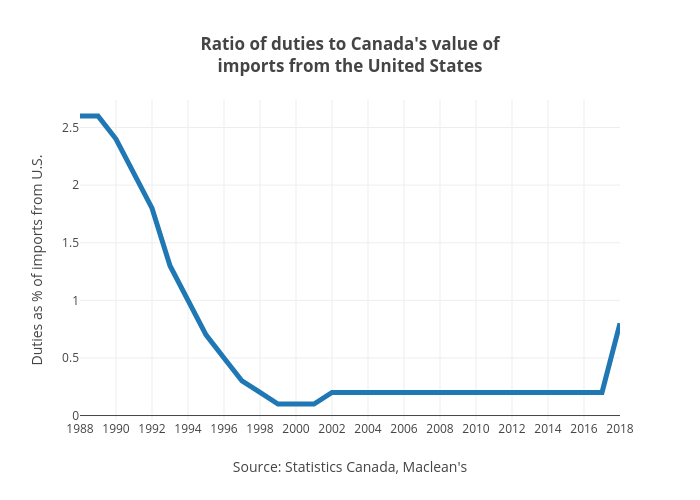 Jasonkirby's interactive graph and data of "Ratio of duties to Canada's value ofimports from the United States" is a line chart; with Source: Statistics Canada, Maclean's in the x-axis and Duties as % of imports from U.S. in the y-axis.. The x-axis shows values from 1988 to 2018. The y-axis shows values from -0.03888888888888889 to 2.738888888888889.